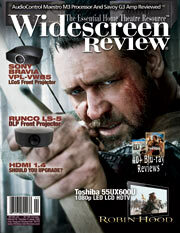 Widescreen Review is a comprehensive collection of articles that help me shape my Home Theatre Experience. The new equipment section is a great resource when planning for new component additions. The equipment reviews also help to identify equipment attributes that may serve well in my environment. As a newcomer to the field of home theatre, Widescreen Review has helped me to understand some of the terminology, and to begin building my home theatre repertoire. In this area, it is helpful to review the reference systems descriptions, which also give ideas on how to set up my room. The DVD and D-VHS release schedule are also useful. All in all, Widescreen Review is a very easy-to-read magazine with great editorial content and a fantastic artistic layout, including great advertisement pages, which in the end helps me gain control of my Home Theatre Experience!